Whilst I'm away on holiday I've got a few guest posts for you all. I requested a summer theme so I hope these all put you in the summery mood despite the British weather. First up is Sinead, how I would like to say a huge thank you to for such a colourful post. Just a quick introduction before I start. I‘m Sinead and I blog here at http://fashionandbeautytribes.blogspot.co.uk, I blog about mainly beauty and sometimes life and fashion. Summer is my favourite season of the month to play with my nails. I love to either go for a pastel or a bright neon colour. When painting my nails in the summer I tend to always do a mixture of colours on my nails for a more summery effect. 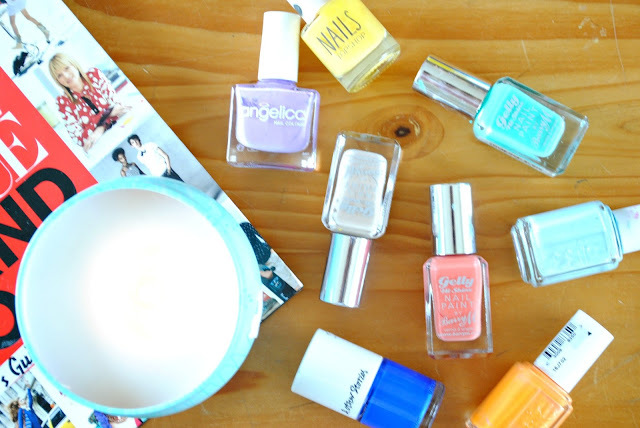 In the photo above I have narrowed down some of my favourite nail polishes that I will be turning to during the summer months. A lot of the colours complement each other and would work well on both their own and together. A lot of the nail polishes are Barry M Gelly Hi Shine; this brand has some really pretty summer pastel shades out at the moment. These nail polish shades are very versatile and can be worn with glitter or confetti effect nail polish on top. What are your favourite summer nails?